Are you taking this powerful antioxidant each day? If not, learn why you should be! 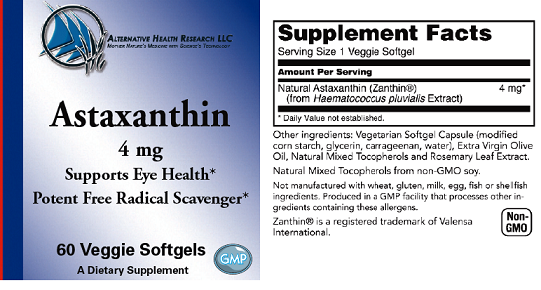 How does Astaxanthin affect our health and energy levels? Astaxanthin has shown to suppress a variety of inflammatory mediators, including TNF-a and COX-1 and 2 enzymes. While its effects take longer to produce when compared to NSAIDS, the results don't include the dangerous side effects that come along with such prescription drugs. All natural anti-inflammatories may take longer to work, but they gently tweak a much broader range of inflammatory composites as opposed to the job of a drug that generally only aims to block a single target molecule. With evidence showing that Astaxanthin can decrease oxidative stress and inflammation, we can conclude that this antioxidant warrants potential promise to the prevention of cardiovascular disease. Studies have shown it to help improve blood flow, decrease BP, increase HDL cholesterol and lower the bad (LDL), and decrease oxidation of the bad cholesterol that contributes to plaque build up. More recent studies are even showing promise in anti-tumor effects in the fight against Cancer. Can't I obtain Astaxanthin naturally through my diet choices, like Salmon? Yes.......and no. Synthetic varieties are more common than not, unfortunately. Fish farmers have been adding synthetic astaxanthin in an effort to obtain that attractive and fresh "salmon" color from otherwise dangerous mass production efforts that yield unhealthy results. Unless you are eating fresh, and very expensive, Wild Pacific Salmon, you aren't likely even coming close to your daily needs. Even still, you would need to eat approximately 4oz per day just to acquire what one 4mg supplement would provide.